Water for thermoelectric power is used in the process of generating electricity with steam-driven turbine generators. Since 2000, thermoelectric-power withdrawals have been compiled by cooling-system type. Once-through cooling refers to cooling systems in which water is circulated through heat exchangers, and then returned to the source. Recirculating cooling refers to cooling systems in which water is circulated through heat exchangers, cooled using ponds or towers, and then recirculated. Subsequent water withdrawals for a recirculating system are used to replace water lost to evaporation, blowdown, drift, and leakage. Prior to 2000, thermoelectric-power withdrawals were compiled by fuel type (fossil-fuel, nuclear, and geothermal). Thermoelectric power cooling water sources include fresh and saline water from both surface-water and groundwater sources. Reclaimed wastewater is a supplemental source of water for thermoelectric power, especially in areas where additional water sources are needed for plant operations. Aerial photo of Beaver Valley Power Station in Pennsylvania, showing evaporation from the large cooling towers. Total withdrawals for thermoelectric power for 2015 were 133,000 Mgal/d, nearly 100 percent of which was withdrawn from surface-water sources, predominantly freshwater. 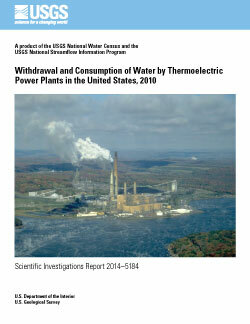 Total withdrawals for thermoelectric power accounted for 41 percent of total water withdrawals, 34 percent of total freshwater withdrawals, and 48 percent of fresh surface-water withdrawals for all uses. Eastern States accounted for 84 percent of total thermoelectric-power withdrawals in the United States and 70 percent of the related net power generation. Hydroelectric-power generation accounts for about 6 percent of the United States total energy needs and is an important energy source in the Western United States. Estimated 2015 thermoelectric withdrawals were 18 percent less than estimates for 2010. Reasons for this large difference include plant closures, a shift from coal to natural gas as a fuel source, and new powerplants using more water-effcient power generation and cooling-system technologies. On average, 15 gallons (gal) of water was used to produce 1 kilowatt-hour (kWh) of electricity in 2015, compared to almost 19 gallons per kilowatt-hour in 2010. Consumptive use was reported for the first time since the 1995 report. Powerplants equipped with once-through cooling systems accounted for 96 percent of total thermoelectric-power withdrawals and 37 percent of net power generated. Consumptive use for once-through systems was just 1 percent of total once-through withdrawals. Plants with recirculating cooling systems withdrew much less water (4 percent of total thermoelectric-power withdrawals) and produced most (63 percent) of the power. Consumptive use for recirculating cooling systems was 57 percent of total recirculating withdrawals. Plants with recirculating cooling systems accounted for 67 percent of total thermoelectric-power consumptive use. Sources for thermoelectric-power withdrawals, cooling-system information, and net power generation included data collected directly from facilities, State permitting or regulatory agencies, the US Energy Information Administration, and linked heat and water budget models for powerplants in the United States. For the 2015 estimates, the linked heat and water budget models were run for the majority of thermoelectric powerplants in the United States (Diehl and others, 2013) to develop powerplant-specific estimates of withdrawals and consumptive use. These data were used either in whole or in part for this compilation. Below are publications associated with thermoelectrice power water use. 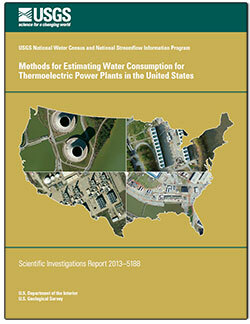 Diehl, Timothy H.; Harris, Melissa; Murphy, Jennifer C.; Hutson, Susan S.; Ladd, David E.
Methods for estimating water consumption for thermoelectric power plants in the United States; 2013; SIR; 2013-5188; Diehl, Timothy H.; Harris, Melissa; Murphy, Jennifer C.; Hutson, Susan S.; Ladd, David E.
Harris, Melissa A.; Diehl, Timothy H.
Diehl, Timothy H.; Harris, Melissa A. Withdrawal and consumption of water by thermoelectric power plants in the United States, 2010; 2014; SIR; 2014-5184; Diehl, Timothy H.; Harris, Melissa A. Below are partners associated with thermoelectric power water use.